French jeweller and traveller (1643-1713). Ms. and printed receipt signed. N. p. Ink & letterpress on paper, single sheet irregularly cut, approx. 180 x 202 mm. 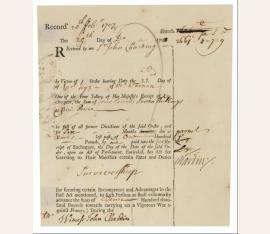 Acknowledging payment of £4 7s 9d for six months interest on money advanced by Chardin as a loan to the crown for the "carrying on a vigorous War against France". - The French traveller Jean Chardin had spent the years 1665-70 and 1671-77 in the Middle East and is considered the most knowledgeable westerner of his period with regard to Persian geography and customs. "In his adopted country Chardin became a tireless advocate for expanding English trade in the East. For over a decade he worked in close concert with Sir Josiah Child, director of the East India Company, to consolidate English trading monopolies in India. He persuaded Child that Armenian merchants, who played a crucial role as factors in Persia, could build up the trade and customs of English factories in Bombay and Madras. In 1688 and again in 1690 he served as an agent for the Armenian nation and negotiated contracts with the East India Company which gave Armenians liberal trading privileges in return for their services. During the same period Chardin expanded his own commercial interests in the Mughal empire, sending his younger brother Daniel to Fort St George to establish a diamond export business in partnership with two Portuguese Jewish merchants. 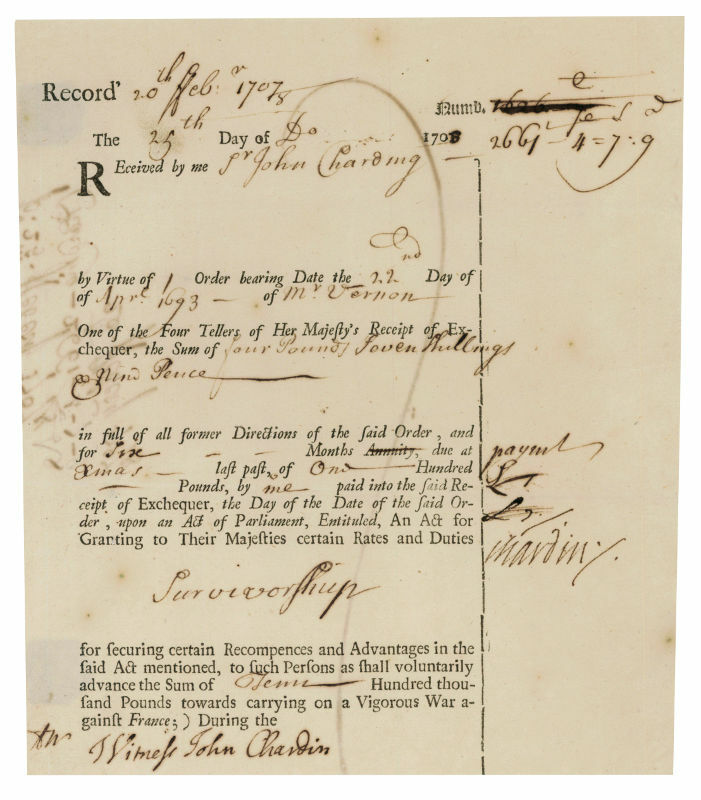 In the 1690s Chardin's close ties with Child and the East India Company soured when Child reneged on promises to promote Chardin as his successor, and Chardin's investments in East India stock plummeted" (ODNB). - Letters by Chardin are rare on the market. A number of letters are preserved in the archive of Daniel Chardin at Yale (Elihu Yale was governor of Fort St. George from 1687 to 1692). 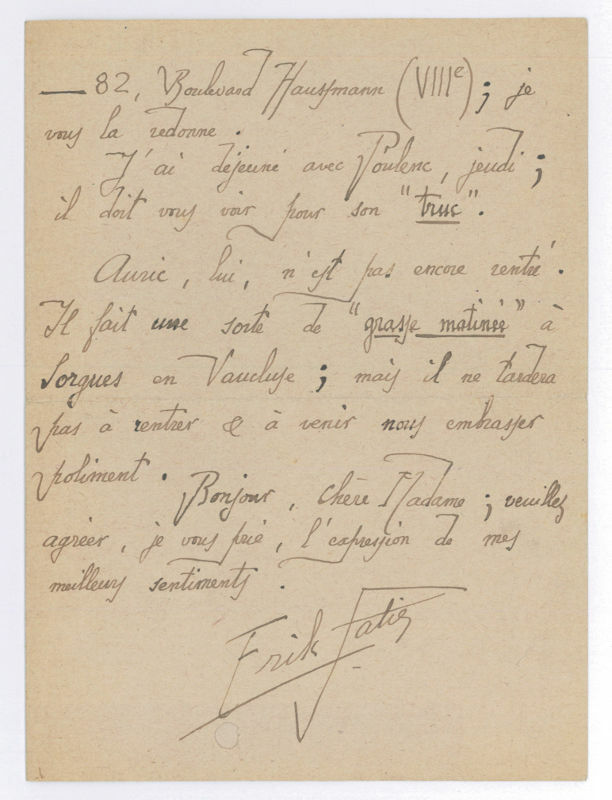 Twelve examples, including letters to both Thomas Pitt and Daniel Chardin, are transcribed and discussed in: Anne Kroell, Douze lettres de Jean Chardin. In: Journal Asiatique, CCLXX, 1982, pp. 295-338..